Construction works are underway at all sites of a new section of the Moscow metro’s Zamoskvoretskaya line. Digging works at the right tunnel between the Rechnoy vokzal and Khovrino stations will be completed in the near future. The Herrenknecht tunnel boring machine has already overpassed 2,140 metres from 2,222 required. At present, the special case for acceptance and dismantling of a tunnel boring machine’s shield is being constructed at the adjunction of the constructed section with the acting Rechnoy vokzal station. A little bit later this complex will be relocated to the Khovrino station and then it will go towards the Rechnoy vokzal station. The construction of the left tunnel will be started. “Excavation work at the platform part of the Khovrino station and the foundation ditch strengthening are carried out by constructors now. 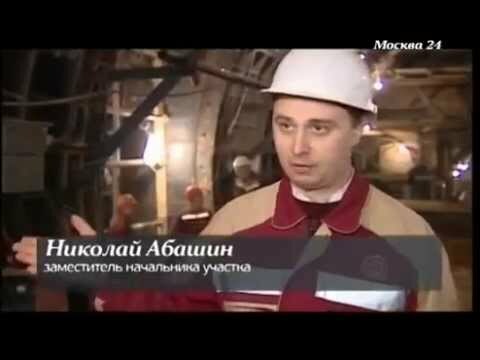 Dead end sidings designed for the rolling stock turnover are being simultaneously built,” says the chief engineer of the Tunnel and Metro Construction Department of OOO SGC-Avtostrada Evgeny Shukaev. According to the Moscow Construction Department, dead ends will become the final point of the Zamoskvoretskaya line in the north. The Khovrino station is being built from the western side of the Dybenko Street near the adjunction with the Zelenogradskaya Street. It will drastically improve the transport accessibility of the Levoberezhnyi and the North Khovrino districts of Moscow and the Khimki city. This station will have two underground entrance halls and become a part of a transport hub. OOO SGC-Avtostrada constructs the facility. OOO Stroygazconsulting is the main contractor and the client is OAO Mosinzhproekt. The report about a new section (from Rechnoy vokzal to Khovrino stations) of the Zamoskvoretskaya line will appear in November in one of the Construction in Details programmes on the Moscow-24 news channel.